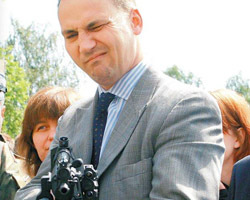 Radoslaw Sikorski (Radek for short) commenced his campaign to be elected High Representative for Foreign Affairs and Security Policy for the European Union in 2009. For openers, he engaged an American graduate student to pronounce him “a strong contender for the position”, “steely-eyed”, and “a dark horse candidate”. Five years is a long time in politics, and in the meantime Sikorski’s campaign to be elected NATO secretary-general, replacing the Dane, Anders Fogh Rasmussen, was lost. From the jaws of this defeat Sikorski has now engaged the deputy editor of the Financial Times, John Thornhill, to promote Sikorski as a runner for Catherine Ashton’s post as the current High Representative (aka foreign minister). According to Thornhill’s promo, published on May 24, Sikorski has suffered so much for his all-European convictions recently, he now has “a slight tic under his right eye”. According to Thornhill, the British government should cast its vote for Sikorski because he was Oxford-educated; speaks “impeccably clipped English”; sends his sons to Eton; belonged to the same club as Prime Minister David Cameron; “reveres Thatcher’s political legacy, and attended her funeral.” Cameron’s vote is essential for Sikorski to get out of the starting-gate. That’s because British Labor Party appointee, Baronness Ashton, is the incumbent; because the French government has at least two candidates it prefers for the job; and because German officials are suspicious that Sikorski plotted to overthrow the February 21 pact he himself signed with ex-Ukrainian President Victor Yanukovich, along with the German Foreign Minister Frank-Walter Steinmeier and French Foreign Minister Laurent Fabius. 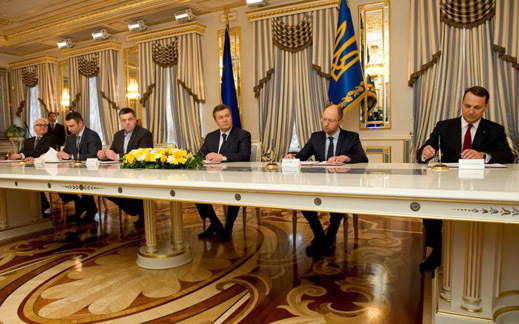 Kiev, February 21: Steinmeier is at far left; Sikorski at far right; Yanukovich in centre, with opposition figures Vitaly Klitschko and Oleg Tyagnibok to the right of Yanukovich. French minister Fabius was on Sikorksi’s left but he is not visible in this picture. Betraying your word and your signature is not normally a qualification for representative office. The allegations reported in Poland are more dramatic than that. According to a report by Nie (Polish for ‘no’), published on March 28, for many months before Sikorski signed the February 21 treaty, he and his foreign ministry, and the Polish security services, had hosted Ukrainian trainees from among Yanukovich’s opponents. Specifically, Nie claimed, in September of 2013 Sikorski’s ministry had invited 86 members of the Ukrainian Pravy Sektor organization for training to the Legionowo Police Training Centre, 23 kilometres north of the centre of Warsaw (below). Their 25 days of training, reporter Marek Miszczuk wrote, included crowd management, “behaviour in stressful situations”, building barricades, storming buildings, arms practice, sniper fire, and the use of anti-personnel gas. The source for the report was alleged to be a Ukrainian who had participated in the training, and who had taken photographs. He provided Nie with his pictures, video clips, and documents to substantiate his claims. They do not appear in the publication. Nie provided no independent verification. The second Nie article to which the ministry spokesman referred can be read here. It does not admit to an April Fool’s joke, nor does it issue a retraction or correction of the original publication. It doesn’t add substantiation. It renews its attack on the credibility of the Foreign Ministry. The Polish media report that the Legionowo centre (CSP) runs training programmes for non-Polish Europeans, and the Foreign Ministry does not dispute that the training can involve weapons and arms handling, crowd control, and other security operations. The European Police College (CEPOL), which is headquartered in the UK – “we contribute to European police cooperation through learning” — confirms that it uses Legionowo for training programmes. According to a press release issued by Legionowo itself, last week it was in Moldavia teaching forensics to the locals. The Russian internet media have picked up the Nie report, adding since then allegations of Polish and US involvement in the flow of arms and fighters to eastern Ukraine. There has been no independent verification of the charges.